We have published a client guide to the English court’s jurisdiction under the recast Brussels Regulation (No 1215/2012), which applies to proceedings commenced on or after 10 January 2015. 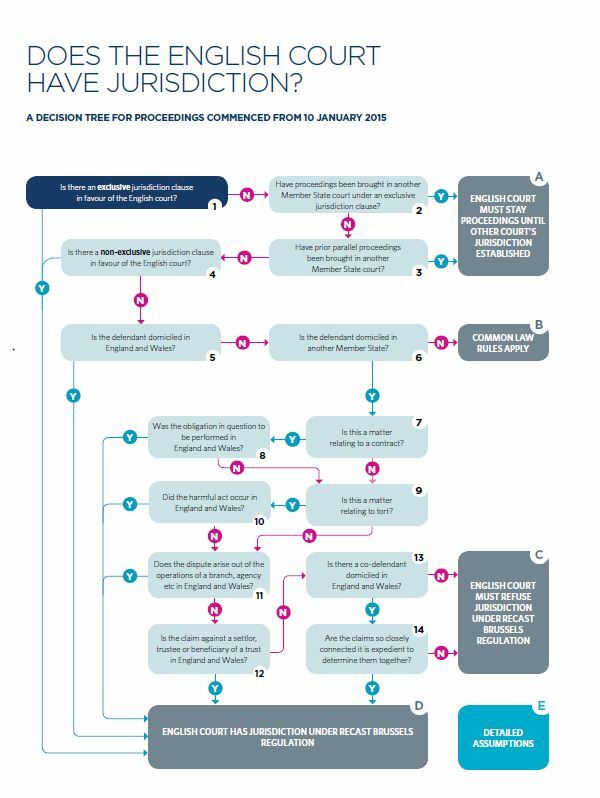 The guide features a decision tree, which is intended as a quick reference to help determine whether the English court will have jurisdiction over a dispute under the new rules. Please click on the image below to open an interactive PDF of the guide (Version 2, July 2015). Once you have opened the PDF, you can click on any of the decision tree boxes to bring you to a more detailed note on the relevant aspect of the rules. Or you can see the notes for Boxes 1 to 14 here, the notes for Boxes A to D here and the notes for the Assumptions (Box E) here.